Mount Hoffman provides sweeping vistas of Yosemite National Park, and is an easy climb to the peak, where visitors are dazzled with the magnificent scenery and fresh mountain air. Mount Hoffman California towers an incredible 10,850 feet, right in the center of Yosemite National Park. Taking in the views from the top makes it a popular hike from May Lake to the summit. 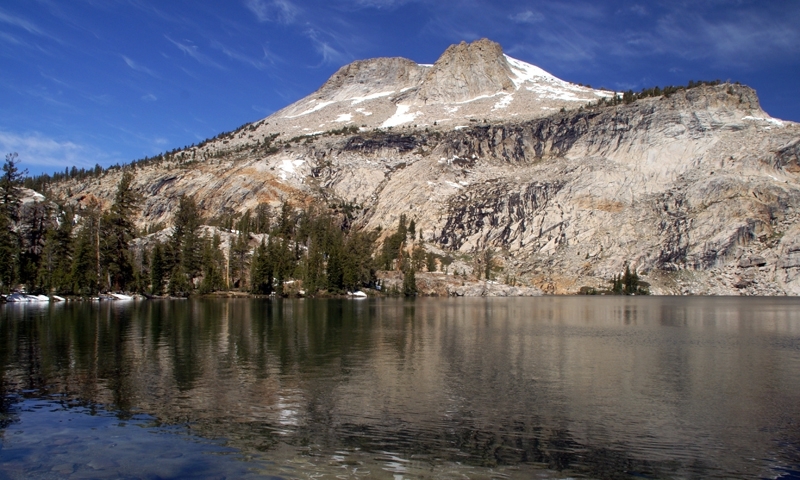 Mount Hoffman Yosemite is accessible from Tioga Road. From Yosemite Valley, drive on Highway 120 to the Crane Flat turn onto Tioga Road, and then travel on Tioga Road for 28 miles to the May Lake turnoff. The best time to come to Mount Hoffman is when Tioga Road is open, which is typically from late May through late October. Mt Hoffman is the perfect hiking destination. You first hike from the trailhead off Tioga Road to May Lake, a 2.5-mile hike roundtrip if only going to May Lake, a 6-mile roundtrip trek if going to the top of Mount Hoffman. Allow about 3 ½ hours. It’s a moderately difficult hike, with steep and rocky slopes and an elevation gain of 2,100 feet. At May Lake you’ll find a High Sierra Campground where you can stay in a comfortable tent cabin near the lake. It’s the ideal respite after a long day of outdoor adventures. Mt Hoffman California has a peak in sharp contrast with the smooth slabs at its base, for while glaciers moved through Yosemite Valley, they only sculpted the bottom of the mountain. Mount Hoffman was named for a man on the Whitney Expedition who climbed the peak when mapping the area in 1863.